There is a reason I come back to Dorie Greenspan's "Baking" again and again. It's not only because the recipes are simple, easy to understand, charming and delicious. On a basic level, I love this book because the recipes always work. After a disaster with [unnamed magazine]'s recipe for cookies which looked and tasted like cardboard, and chocolate ganache which was so sweet that I had to throw away the whole batch (throw away a batch of cookies! nooo! ), I felt in need of some therapy, so I sidled up to "Baking," stroked the cover lovingly and opened it to the bundt cake page. Now, there was no photo of this bund cake in the book. 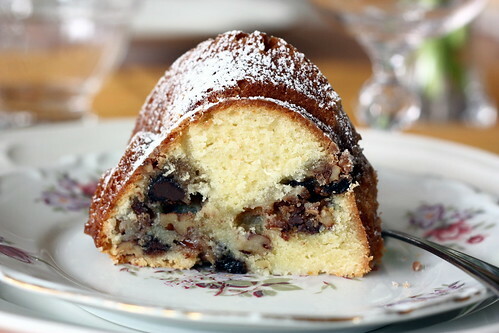 I think it was a deliberate ploy to give your imagination room to run free, because when I saw the name, "Nutty, chocolaty, swirly sour cream bundt cake," my mind kind of exploded into bliss and I had to take a moment to calm myself down before running to the kitchen to take the butter out of the refrigerator. Holy bundt cake, GOOD LORD YES. This cake was everything I had dreamt of and more. 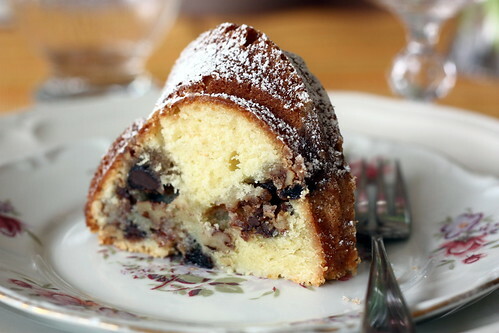 I used to think that bundt cakes were dry and boring, in need of coffee or tea to choke them down. The error of my ways is clear to me now. Dry? Boring??? This cake is anything but. The smell alone is enough to drive anyone crazy, and the taste, with the orange and the sour cream and the chocolate and the pecans/raisins/cinnamon trifecta, and mmmmm..... so much happiness. Position oven rack in center; preheat oven to 350°; butter a 9- to 10-inch Bundt pan, dust the interior with flour and tap out the excess; do not place the Bundt pan on a baking sheet. Make the swirl: add all the ingredients to a bowl; stir to mix. 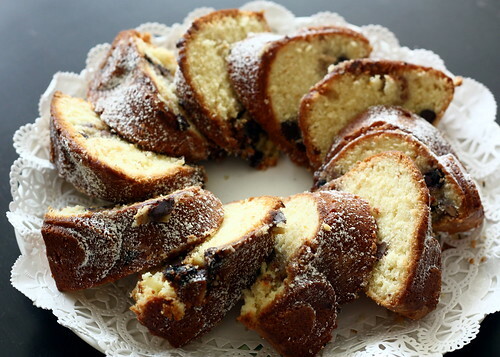 Make the cake: whisk the flour, baking powder, and salt together in a bowl. Working in the bowl of a stand mixer, rub the sugar and zest together with your fingers until the sugar is moist and aromatic. Add in the butter; with the paddle or whisk attachment beat on medium speed for 4 minutes. Add in eggs one at a time, beat for 1 minute after each egg goes inches. Beat in the vanilla; decrease mixer speed to low and mix in the sour cream. Still on low speed, add in the dry ingredients and mix only until they disappear into the batter. Give the batter a last stir or two with a rubber spatula, then scoop about 1/3 of the batter into the Bundt pan. Evenly sprinkle on half of the swirl mixture, then spoon in the rest of the batter. Make a shallow indentation with the back of a spoon in the center of the ring of batter and fill it with the remaining swirl mixture, then cover the mixture lightly with the batter on the sides of the indentation—the batter probably won’t cover the mixture completely and that is fine. Bake for 60-65 minutes, or until a pick comes out clean. Transfer pan to a rack and let the cake rest for 10 minutes before unmolding it onto the rack to cool to room temperature. Just before serving, dust the cake with powdered sugar. this looks beautiful! your pan is very pretty. Oh how lovely! I know what you mean about dry, dreadful bundt cakes. This looks so moist and fabulous! This looks heavenly. It looks incredibly moist and rich - divine. I may have to give this a try tomorrow. Gorgeous. Your bunt cake look superb Irene! I too love Dorie's book, and I've been eyeing this recipe for a while, I think this weekend I'll have to make it! Wish I had a slice right now! Gorgeous cake! Looks really delicious! Looks awesome, I love everything about this recipe. Amazing, thanks will have to try this very soon! This looks scrumptious! I love bundt cakes and the sound of chocolate and sour cream together is music to my ears. Lovely! I love that cookbook too. So reliable -- as this cake attests. That looks amazing - your photography is stunning too! Sigh. Don't you hate recipes that just don't work? I really NEED to buy that book. I love Dorie. Yes! I really hate wasting good ingredients! okay, this looks pretty much amazing!! I'm going to try this cake now. Irene, where do you buy your recipe books? Honestly, I get all of mine used from Alibris (or they are presents from others). I love used books, especially cookbooks. It looks lovely and definitely dry and boring. 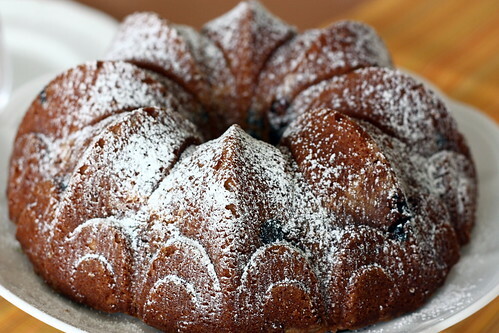 usually, in my mind, bundt = boring. no question. this, however, looks refreshingly interesting! yum! How did it turn out? Sounds like a really interesting substitution! The orange zest is, I think, not crucial to the cake. This one is definitely one of my favorites!